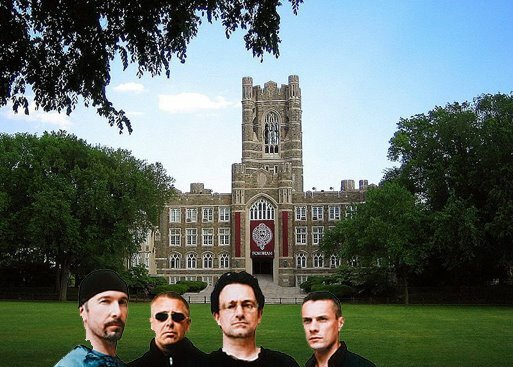 U2 has been making its rounds with its secret concerts. In New York City, the show took place last week at Fordham University's Bronx campus. I'm not sure what to think of a secret concert. It's cool in one sense because it feels like a bonus. You didn't expect the band to be touring, and then all of a sudden, they're in your town. There's something fun about showing up at a concert feeling like an insider. But when I heard U2 was doing this, I couldn't help but think of Radiohead - when they asked fans to name their own price for the "In Rainbows" album online. It feels like a publicity stunt. Or maybe it was the media, not U2, that wanted and willed a secret event to gain public attention. This got me thinking, what makes a concert truly awesome? I think it all comes down to the performance. This is not to be confused with showmanship. I'm more impressed with how the songs sound live than with how many moves you have or how many lasers you have shooting off in countless directions. For instance, I saw Pink Floyd at Foxboro Stadium and it was nothing spectacular. The laser light Floyd show at your local planetarium will suffice, and I'm not exaggerating. New Order at Continental Arena, terrible. They sound infinitely better and more together as a band on my iPod. Bjork impressed me at the Hammerstein Ballroom because of the vocals and the live string ensemble, not her costumes. Toad the Wet Sprocket at Boston's Paradise Club were amazing. And yes, U2 really is that good when you seem them live. It's all about the music. secret concerts? what's that about... i say boo! I too saw Floyd at Foxboro. 1988.